Photograph courtesy John Wraithmell Its November 1963 and D7578 is complete and ready for about twenty one years of service. It looks like the locomotive has already been out on the road for running-in tests. To the left is D5159 which had been outshopped new from Darlington during July 1961. The twenty year five month career of D7578/25228 included allocations to Scottish, Eastern and London Midland Region depots. Built: BR Darlington Locomotive Works. Non-standard Battery Isolating Switch Cover - three circular hinged discs. Center lampbracket & other fittings removed. Time between last Classified repair and withdrawal: 63 months. Time between withdrawal & scrapping: 39 months. December 1963 to York (50A) on loan. January 1964 to Leeds Neville Hill (55H) on loan. June 1964 to York (50A). October 1964 to Toton (16A). November 1964 to Derby (16C). April 1965 to Colwick (40E) on loan. May 1965 to Nottingham Division (D16). March 1967 to London Midland (Midland) Lines. September 1967 to Eastfield (65A). June 1969 to Haymarket (64B). Withdrawn March 20th 1984 (whilst at Derby Works). 25228 was the 215th Class withdrawn, the only Class 25 retired during March 1984. 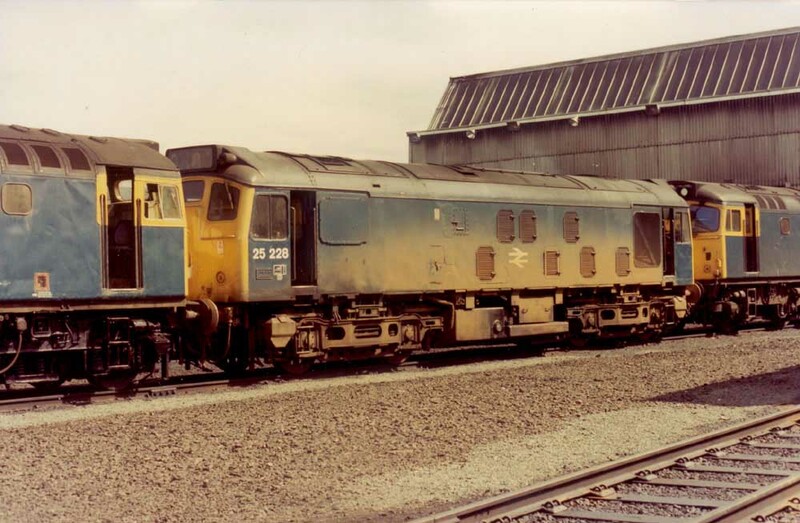 25228 had been sent to Derby Works (from Crewe?) late in January 1984 for repairs but these were cancelled and the locomotive withdrawn. On February 4th/5th 1985 25228 moved as part of a dead engine movement (25036/049, 25150, 25228/253/277 25304/317/320) 9X12 Derby Works to Swindon Works. The movement to Swindon Works did not hasten the end of 25228. 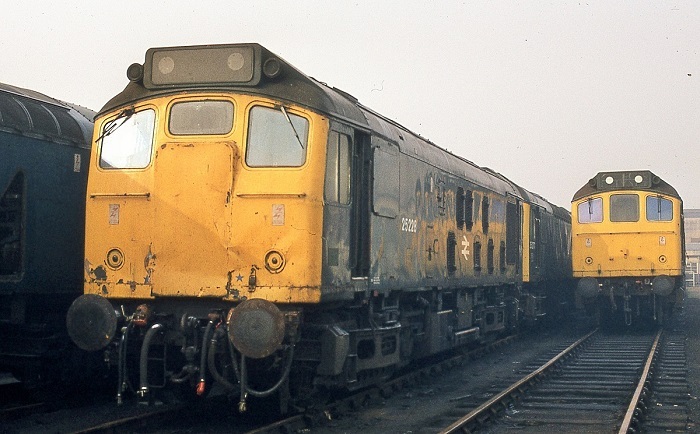 The rundown and closure of the Works left a number of withdrawn locomotives with an uncertain fate including 25228. To clear the Works Vic Berry was called in to deal with the remaining locomotives. A decision was made to move the remaining mainline locomotives (no shunters) to Berry's Leicester yard for breaking up. The move was made in two steps, initially 25027/75, 25123/133/144/158, 25228/234, 97202, 40046/63 were tripped from the Works to nearby Cocklebury Yard on May 26th 1987. Then between June 2nd & June 11th the same locomotive convoy travelled from Cocklebury Yard via Oxford to Leicester, for the Oxford - Leicester portion 20019 & 20197 hauled the convoy. 25228 was broken up during the third week of June 1987, although the cabs lingered a while longer. Noted Derby Works February 1966. Noted Derby Works February 1968. Noted Glasgow Works February 1971. Noted Glasgow Works August 1974. Noted Glasgow Works June 1978. Noted Glasgow Works November 1979 (N4 repairs). Noted Glasgow Works October 1980 (N4 repairs). After the completion of the ten locomotives transferred from Derby Works (D5223 - D5232), Darlington Works set about its final build of Class 25s: D7578 - D7597. 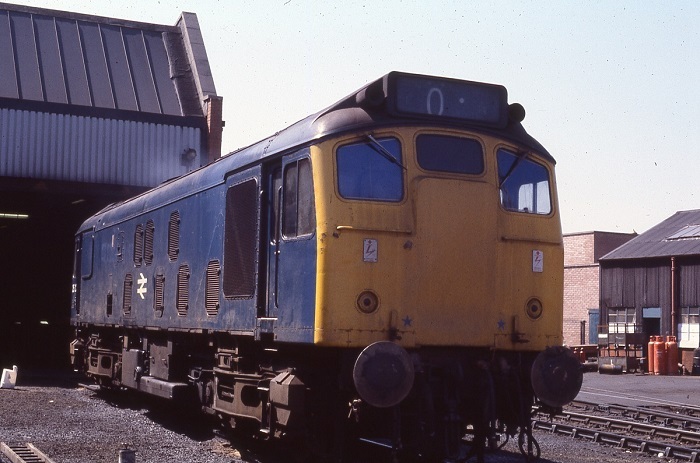 Although these last twenty machines were externally similar to D5223 - D5232, they featured internal changes and would be later designated Class 25/2. These were all boiler equipped. 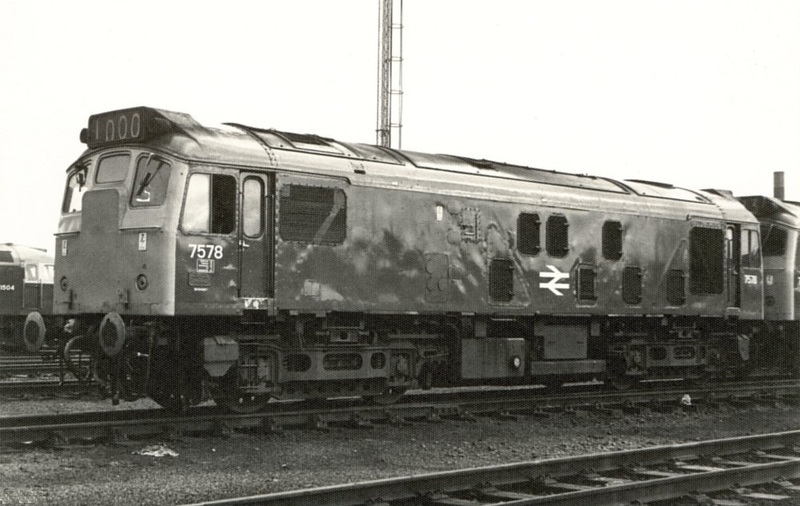 The first of these, D7578 was delivered from Darlington Works during November 1963, being delivered to Nottingham (16A), and used to continue to remove steam from the Midland lines. It went on loan to York (50A) during December. In January D7578 was loaned to Leeds Neville Hill for six months, returning to York during June. In October it returned south to Nottingham, then on to Derby (16C) during November. Whilst on loan to Neville Hill D7578 was used on passenger turns including March 26th's eight coach 15.30 Manchester Victoria - Newcastle throughout. This was the week before Easter when the many extra specials running may have stretched the motive power departments. On May 29th D7578 was noted at Scarborough with a 'York Trail Train' comprised of about nine elderly coaches. The locomotive was displaying headcode 3Z89, a headcode very similar to the one in the opening photograph on this page. During January D7578 became one of the Nottingham Division (D16) allocation. During April it was loaned to Colwick (40E) for about a month, replacing the previous loaner D5296, D7578 returned to the Nottingham Division in May when D5195 was loaned to Colwich shed. On July 1st D7578 went to the seaside working the Nottingham - Llandudno Town and return, interestingly double headed with D5232, the previous locomotive delivered from Darlington Works prior to D7578! At the end of the summer timetable D7578 was sent north to Eastfield (65A) during September. It would spend the next fifteen years allocated to Scottish Region depots. During February contractors moved in to begin lifting the closed Dumfries – Stranraer line. BR supplied the contractors with wagons for recovering the scrap materials, on February 23rd D7578 was noted on this train at Killywhon (Kirkcowan). After nine months at Eastfield 7578 moved across to Haymarket depot (64B) during June. A typical passenger working for the Haymarket locomotives was the short hop from Carstairs to Edinburgh on variety of workings. On October 13th 7578 worked the 17.20 Edinburgh - Liverpool as far as Carstairs. 7578 was noted at Polmadie during July in ex-works condition, with indications of having been recently outshopped from Glasgow Works. On June 29th 7578 took a five coach Royal train from Edinburgh to Dumbarton (presumably an empty stock move?). With the introduction of the Class 27's and Mk II passenger stock on the Glasgow - Edinburgh service it was probably not expected that other types of locomotives would be used on this service. But they were and during 1971 7578 was noted on at least two services, on August 15th it worked the 22.00 Edinburgh - Glasgow Queen Street with 5391 and on November 10th worked the 13.30 Edinburgh - Glasgow Queen Street with 5386. Photograph courtesy Danny Preston, collection of Neil Johnson. A portrait of 7578 at Haymarket June 3rd 1972. The locomotive sports one of the more unusual Scottish Region modifications, the standard horizontally hinged battery isolating switch cover has been replaced with a metal panel containing three circular access plates. The hinged ventilator to the right of the BR emblem is also non-standard. On June 22nd the 08.15 Birmingham New Street - Edinburgh was worked forward from Glasgow Central by 7578. Further trips on the Glasgow - Edinburgh service included September 6th's 16.00 Glasgow Queen Street - Edinburgh with 5411 and October 13th's 13.30 Glasgow Queen Street - Edinburgh with surprisingly 7591. Two days later the same pair were noted on the Edinburgh portion of the Up West Coast Postal. On New Year's Eve 7578 & 5409 were in charge of the 21.00 Glasgow Queen Street - Edinburgh, somewhere west of Linlithgow the train got into trouble and required the rear-end assistance of 7580 & 5411. During April 7578 was renumbered to 25228. 25228 was noted at Glasgow Works during August whilst on August 14th it was recorded as working the 1G90 14.05 Birmingham New Street - Edinburgh forward from Carstairs. Also on the 14th it was noted with 26020 at Perth on a Glasgow - Dundee service, a ex-works running-in turn for 25228? An interesting pairing occurred on May 17th when 25228 & 24014 worked the 23.10 Edinburgh - Inverness as far as Perth. On May 20th 25226 & 25228 worked the Leith - Theale pipe train. The 17.10 Edinburgh - Berwick was worked by 25228 on October 19th. 25228 was transferred to Inverness during May. During May 25228 worked two railtours. On May 21st an SRPS railtour was handled throughout from Burntisland to Ardrossan Harbour and return. The next weekend (28th) the first leg of a railtour by the Kirkcaldy Lions Club was worked by 25228 & 26034 from Kirkcaldy to Perth (destination Aviemore), steam locomotive 60009 was also featured on part of the railtour. The following day 25228 & 26034 were still together, now in charge of the 09.00 Edinburgh - Inverness throughout. After a year allocated to Inverness 25228 was transferred to Eastfield during May, it was noted in Glasgow Works during June. The fine summer's day of June 17th 1978 finds 25228 parked at Haymarket waiting for attention or its next turn of duty. On September 14th the 17.05 Inverness - Glasgow Queen Street was hauled by 25228 & 26011. On March 14th 25228 worked the 08.07 Glasgow Queen Street - Oban and 12.20 return. September 7th saw 25228 working an Oban - Glasgow service. During November 25228 was noted at Glasgow Works for N4 repairs. Christmas Eve travellers had the delights of 25228 on the 1G45 11.03 Perth - Edinburgh. The SRPS Whiskey Special railtour, Falkirk - Dufftown - Falkirk - Aberdeen was handled by 25228 on May 31st with the exception of the return leg forward from Stirling, this last leg being worked by 27010. Whilst working September 19th's 2T38 15.58 Dundee - Glasgow Queen Street, 25228 became a failure somewhere in the Stirling area, rescue came in the shape of 20108. During October 25228 returned to Glasgow Works for more N4 repairs. 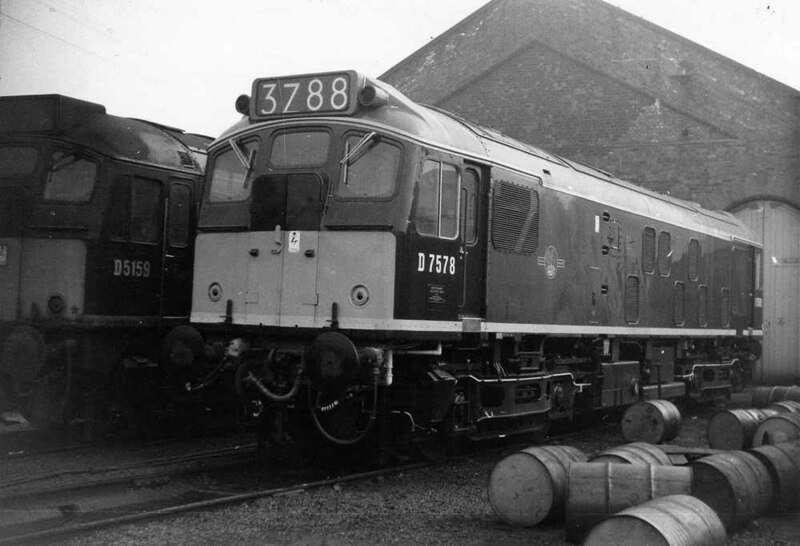 Photograph collection of webmaster A work stained 25228 is sandwiched between two Class 27s at Eastfield depot, date unknown. The previously mentioned non-standard battery isolating switch cover has been replaced in this view with the standard type. The passenger workings for 1981 provide a fine example of just how wide ranging were the Scottish Region's Class 25's. Another short working familiar to the Class 25's was the connection with the 1S07 Euston - Inverness, working the Mossend Yard - Cowlairs Junction leg. On February 9th 25228 worked the 04.22 Mossend Yard - Glasgow Queen Street connection to Cowlairs Junction. A similar turn was handled on August 22nd. 25228 was busy on March 21st on the ex GSWR Glasgow - Carlisle route working the 1S50 08.40 Carlisle to Glasgow Central and 1M02 14.00 return. The 23.40 Edinburgh - Bristol Temple Meads used 25228 on the Carstairs leg on May 15th, connecting at Carstairs with the Glasgow portion. On July 21st 25228 was in charge of the 2G10 05.55 Stirling - Edinburgh. Class 25s were used regularly on banking duties across the network, on the Scottish Region trains were frequently assisted in the rear out of Glasgow Queen Street - on August 25th 25228 banked 40073 and the 09.35 Glasgow Queen Street - Aberdeen to Cowlairs. Photograph courtesy Mike Cooper Its the summer of 1981 as 25228 passes Hillside on the former Caledonian Railway line approaching the junction with the North British route at Kinnaber Junction. 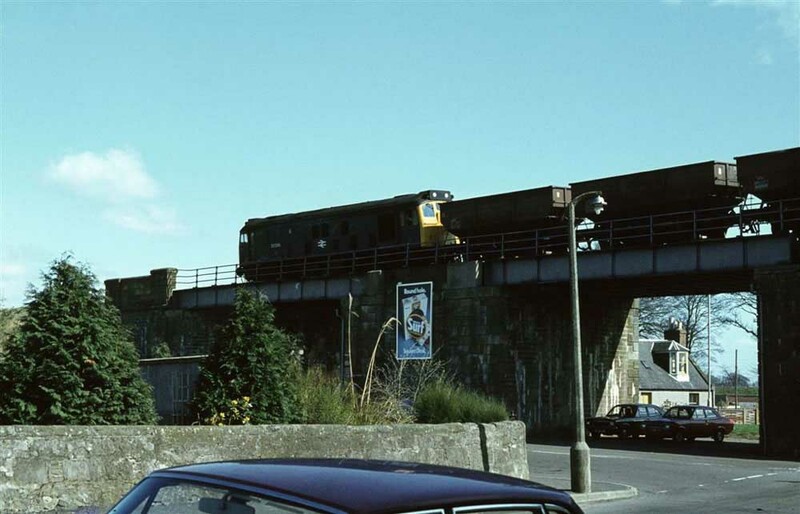 The viaduct is now demolished. After almost four years allocated to Eastfield 25228 was transferred to Haymarket during March. On March 27th 25228 worked the 18.15 Edinburgh - Glasgow Queen Street in lieu of the diagrammed Class 47. It may also have worked the return leg. 25228 received its last 'E' exam at Haymarket during July. After fifteen years of service allocated to Scottish Region depots 25228 was transferred to Longsight during September, this would be its last transfer. On October 16th 25228 came to the rescue of the 1E66 13.15 Birmingham New Street - Norwich, assisting the train from Saltley to Leicester because of a locomotive failure. On October 29th 25228 was in charge of the Hexham pick up goods. Although 1983 was 25228's last full year in service it was able to cover a number of passenger services. The first was on May 17th when the 09.19 Morecambe - Leeds diesel multiple unit ran out of fuel at Carnforth and 25228 assisted to Leeds. On June 14th 25228 was noted at Warriongton Arpley with a very short freight. On June 17th 25228 was noted at Guide Bridge with the headcode panel missing from the No.2 end with the rubber trim hanging down from the headcode box. 25228 was back at Leeds on July 6th working the 1M26 16.00 Leeds - Carlisle when diagrammed 47405 was unable to start the working. 25228's last known passenger workings featured the Cambrian Lines. On July 16th it worked the 07.35 Euston - Aberystwyth from Wolverhampton to Shrewsbury with 25239. The latter locomotive suffered dragging brakes and was failed. A week later (23rd) things were a bit better, this time 25228 & 25239 worked the 10.10 Euston - Aberystwyth forward from Birmingham New Street and returned with the 17.15 Aberystwyth - Crewe, normally terminating at Shrewsbury but this day extended to Crewe. on July 29th 25228 was noted at Timperley with a short rake of brand new Rockware glass tanks. On August 12th 25228 worked the 15.10 Manchester Piccadilly - Bristol Temple Meads parcels. 25228 & 25277 moved from Willesden to Derby Works on January 25th 1984. The intent had been to provide repairs to 25228, but the repairs were refused and the locomotive withdrawn on March 20th 1984. Photograph courtesy Adrian Healey 25228 in the yard at Derby Locomotive Works on February 14th 1984 with no place to go. The minor collision damage to the cab front has sealed its fate. In years gone by this would have been easily repaired, but in 1984 the best that can happen for 25228 is to surrender parts to keep other members of the Class running for a little longer. Page added June 3rd 2009. Last updated March 26th 2019.